Eco Machu Picchu Pueblo i Aguas Calientes, Peru: Reservér nu! 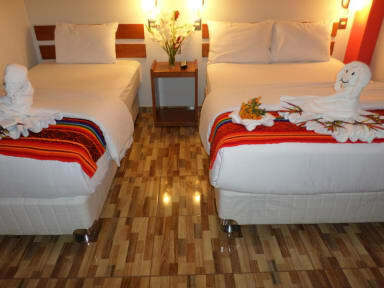 Eco Machu Picchu Pueblo is a friendly hotel in the heart of Aguas Calientes. The property offers different types of rooms (single, double or triple rooms). At Eco Machu Picchu Pueblo you will find a 24-hour front desk, a bar and a snack bar. Other facilities offered include a shared lounge with TV and luggage storage. Free Wi-Fi is as well available. A buffet breakfast is offered. The property will be happy to give you information about Machu Picchu tours. Eco Machu Picchu Pueblo is perfectly located in Aguas Calientes, perfect for those who want to make trips. The hotel is located only 200 metres away from the Main Square and 8 km from the Machu Picchu Ruins. Velasco Astete International Airport is 111 km away. All rooms (single, double or triple room) have a private bathroom. The rooms are well-maintained and simply decorated. For your comfort, the property features towels, desk and linen. Based on local tax laws, Peruvian citizens (and foreigners staying more than 59 days in Peru) must pay an additional fee of 18%. Foreign business travelers, who require a printed invoice, will also be charged the additional 18% regardless of the length of their stay in Peru. This fee is not automatically calculated in the total costs for the reservation.